Resources for Students - WELCOME TO THE MSJH Library WEBSITE! This section is devoted to the STUDENTS of MSJH. Please check back often for additional sites, new books, or other new tidbits of info to help you get your research on. This page will be constantly growing as I find new materials to help you research better. You should ALWAYS turn to EBSCO first. This research database has VERIFIED, FACT CHECKED research articles, newspaper articles, video clips, and images. You can email articles to yourself, and EBSCO provides the citations for you. The Mahomet Public Library has access to research databases for FREE! If you have a MPL Library Card, you can access these databases at anytime--from home, school, ANYWHERE. If you do not have a MPL Library Card, you can still use these databases for free when you are at the library. NOTE: If you are accessing these databases from OUTSIDE of the Mahomet Public Library, you will be asked to enter your library card number to gain entry to them. A simple layout. An easy search engine. Great research results. The British Broadcasting Company has grown itself into the world's most reliable news outlet. But, the BBC isn't just about news: You can also research at their website! Use the search box at the top right to find information on everything from breaking news to books to historical events and sports. Just because you don't live in Champaign doesn't mean you can't take advantage of their library's awesome teen resources. There are great online databases you can use, and you can even get an idea of what to read next with the help of their scrolling book lists. Books! They still work! You can open them, and you can find information about important people, places, and things. In the library you can find the Research Resources next to my desk. Don't be shy: Come in, and I'll show you how to use them wisely. But, be careful: Books are your greatest research weapon you could ever have. You never know what you'll find. Here are some awesome sites to help you with your research on your upcoming Hominid Presentation. I will always tell you to use Wikipedia as a last resort. Turn to these trusted and reliable resources first! Smithsonian Institute: What Does It Mean to be Human? The Smithsonian Institute offers some of the most in depth and detailed information on human origins around. Please check out this worthy resource. WARNING: There is A LOT of information, links, videos to watch, and other fun things to see and explore on this site. You might want to give yourself a time limit when first examining this site. This great website has an easy search bar in the upper right hand corner. Enter in your hominid name, and you will be directed to several articles about that hominid. You'll usually want to choose the FIRST return result, since it will have a definition and basic information about your hominid. BBC is one of THE BEST and MOST TRUSTWORTHY news sources in the world. You will find pictures of skulls of each hominid group, and you will click on that skull to find out more information on your category. You will find so much useful information, but make sure you put it in your own words! This might go a bit above and beyond your typical research, but if you're truly interested in human development and the process behind it, this extracurricular viewing is for you. The coolest part about this TV documentary series is listening to the scientists come up with hypostheses about our earliest ancestors and then trying to prove these hypotheses. There is information on the site about Homo neanderthalensis and Australopithecus afarensis, as well as other hominids, but this site will really feed your desire to learn even more than what you've been asked to research. NOVA never makes a boring documentary, either, so if you have some spare time, give this site a go. The best part? Each episode of the three-part documentary is available for free viewing. If you're a 6th grader, your ELA teachers have found reliable websites for you to use, so you don't need to do a messy Google Search. If you use these reliable websites, along with some help from the EBSCO Research Databases, you'll be able to create your King Tut Death Certificate in a jiffy! Bubonic plague! Death! Dying! Serfs! Castles! The Crusades! Oh, what FUN the Middle Ages were! Click on the RELIABLE links below to find information for your research project. Several of the links include engaging and informative videos. Please take time to watch those, too, because they will enhance and enrich your understanding. Ducksters for Research -- A fun fact-filled history portal for all your research needs. You will find a lot of good, start-up, basic information at this website. History: The Middle Ages -- You will not get better medieval history than the info you can get from the BBC. The information is PLENTIFUL, with LOTS OF WORDS, but the images are there, too. Please give this site a chance, even if you do have to do a lot of reading here. It will give you everything you need and more! Middle Ages -- Hosted by history.com, this page is full of easy to understand information, videos, and has major topics of the Middle Ages clearly highlighted. Encyclopedia Brittanica Middle Ages -- A brief introduction to the Middle Ages complete with links within the article for further research. Medieval Life and Times -- An in-depth resource for information on Medieval history, topics, and events. This site has SO MUCH information! It is maintained by a British researcher of Medieval Times. Timemaps: Medieval Europe -- This site includes maps and photographs of the places in Medieval Europe. It has good information, with the only downside being you have to scroll down for new topics. (The topics are in BOLD PRINT, but not linked throughout the article.) At the very bottom of the page, and the end of your scrolling, there are a few links to further your medieval reading. Hand On History: The Normans -- From the BBC comes a bunch of fun games and activities you can do concerning the Middle Ages, including: Medieval Feasting, Castle Activities, and Fiction & Non-Fiction Reading Lists on the subject. The Cable Guy -- See medieval times recreated oh-so-accurately in this clip from the 1996 film starring Jim Carrey and Matthew Broderick. A Knight's Tale (trailer) -- Watch the trailer for this awesome 2001 film that electrified audiences with medieval fight scenes, wicked sweet music, dance scenes, and a little romance to boot. After watching the trailer, you'll definitely want to see the film! Here is a starting list of reliable web resources you can use for your storms research. I am not going to give you specific links to each topic at the NOAA website, BUT if you use their search box in the upper right hand corner you will be able to find a wealth of information on thunderstorms, tornadoes, hurricanes, lightening, and other major storms. As I said, I won't give you links to each topic, but I'll give you ONE NOAA link to their info page on severe storms. It has general and specific info, but make sure you are finding the appropriate research for your topic. Search through the list of different types of weather for info on thunderstorms (even superstorms), hurricanes (Yes! you can find past hurricane names), and lightning (including number of deaths due to lightning strikes). Information on climate and specific hurricanes is also available. Want to research tornadoes on Fact Monster? Well, you'll need to use the Natural Disasters subtopic. Here there is also an info link made specifically for U.S. tornadoes. Here are some awesome websites you can visit to see photos taken by storm chasers or other videos that will make you marvel even further at the wonder and power of storms. Mike Hollingsford makes a living out of chasing storms. This Nebraska native has some truly stunning storm photography on his blog. Curious to see if a severe storm is on the horizon? Check in with this map courtesy of website Weather Underground. Especially good to have handy during Tornado Season! You know it. You love it. DUCKSTERS for all of your history needs!!! An easy to search VISUAL menu helps you find the subject you're researching quickly! A WEALTH of knowledge on ancient kingdoms and civilizations. Click your topic below, OR go to the Ancient History Encyclopedia front page (link above) if you want to do some more specific searching on your own. Okay. OKAY. It's the end of the year. IF you want to use Wikipedia this time for your ancient kingdom research, it actually has some pretty great info (the librarian said begrudgingly). NOTE: These articles tend to be longer and more detailed than the ones you'll find on Ancient History Encyclopedia. Wanna be someone else?...Or at least do some research to pretend to be someone else? Well, check out some of these top notch sites I have for you below! This FREE online encyclopedia is one more source to go to for your research. Underneath the search box, you can choose between using the Student Encyclopedia (ages 11 and up) or the Kids Encyclopedia (ages 8-11). This would be a great starting point for your research. Ducksters is BACK! Not only did this site have great information for your Medieval Times research project, but it also has biographical information on some of history's greats. The fastest way to find out if Ducksters has info on your historical character is to search his/her name in the search box in the UPPER RIGHT HAND CORNER. This is a great source for a wide variety of historical icons as well. Great images and information are available for your subjects. The search box is--once again--the place to be to enter your figure's name to get information. Don't be discouraged by the term "kids." This site has amazing poems transcribed in full text, and several are read by the authors. Sign up to have the Poem a Day sent to you, or just click here and read it while you are working on your Poetry Project! The Writer's Almanac ran on PBS radio stations across the country from 1993-2017. Everyday, author and performer Garrison Keillor would read a short biography of an author and then read a poem. On the archive site, you can access almost every recording from the entire series. The last Writer's Almanac aired on November 29, 2017, my 15 wedding anniversary to my husband. Although it was a happy day for our anniversary, it was a sad day for the end of this program, which was one of my all-time favorites. Below you will find some helpful websites for your American Revolutionary War Timeline project. These sources are not the only ones out there! However the list I have compiled does include reliable, trustworthy websites. This PBS documentary series highlighted important events from the American Revolution in dramatic reenactments. Check out the section on Chronicle of the Revolution for specific years during the war. Speaking of timelines...This site created by the Smithsonian Institute is set up as a timeline of all of the wars the United States have taken part in. The American Revolution is presented as the War for Independence on the timeline, so make sure you click the correct link. This site, created by the History Channel, includes videos, leaders/founding fathers, events, photos, and a "Dig Deeper" section. This site is chock full of information that will make your project in-depth and interesting. This is an in-depth site, created by an amateur historian. It includes timelines, battles, events, people, and so much more. Under the ABOUT section, the author of the site includes information on how you can reference this website. Even though he is an amateur historian, I feel his research is accurate, and he is presenting information on a topic he truly loves. An encyclopedia resource for your research. Within the article many links are included to other Britannica articles on events from the American Revolution. You will find several books about Native American tribes in the library to help you acquire your print resources. Below you will find several RELIABLE links when doing your online research. NOTE: When you are searching for your information on the internet, you will need to be careful. For example, if you search "native american living conditions," you will receive hits for information on Native American living conditions FOR TODAY. Be careful that you are finding the CORRECT TIME PERIOD for your research. OVERVIEWS--These are good places to start your research, but please make sure you have more than one source for your project. Wikipedia.org -- At this site, you will need to type in your tribe in the search box. Wikipedia really does have good information on each of the tribes you are researching, and there is A LOT of info on each tribe, too. Federally Recognized Native American Tribes -- Wikipedia provides you with an alphabetical listing of the federally recognized tribes of North America. 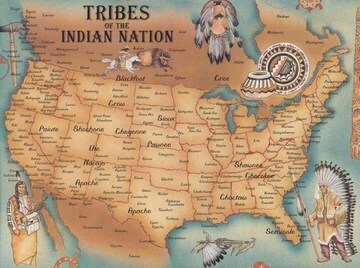 Native American Tribe List -- An alphabetical listing of the tribes of North America. Smithsonian Institute's National Museum of the American Indian -- An outstanding site with a wealth of information about Native American tribes. You can search by your specific tribe in the search box that is located in the upper right-hand corner of the front page. UIUC Native American LibGuide: Image Database -- There are many websites here which you can search for beautiful images to study and enhance your understanding of Native American tribal life. Native American Climate and Geography -- A short YouTube video showing how geography and climate impacted Native American tribes. The video is based on a presentation by a high school teacher in Houston, Texas. Check out the resources at the end of the presentation for more research options! American Indians and Their Environment -- This is actually a teacher's lesson about the environment of tribal Native Americans, but it gives an overview of their environment and has links to primary source images. Smithsonian Institute: Objects Collections -- Get brief overviews of items that Native American tribes may have used in their everyday life. Smithsonian Institute's Infinity of Nations: Object Gallery -- Explore artifacts gathered from Native American Nations around North America. Native American Homes -- This site gives you information on a variety of Native American homes and how they were constructed. Ancient Native American Homes -- This YouTube video gives you a glimpse inside Native American homes that have been recreated based on research of Native American tribal homes. It's an amazing look into what homes of the United States' native peoples could have looked like. We Shall Remain: Language Overview -- An overview of several Native American languages from the PBS documentary We Shall Remain. This link includes information on the Cherokee, Nipmuc, and Shawnee languages, as well as links to other articles about Native American languages. BBC Bitesize: Native Americans -- A bite-sized summary of the lifestyle of Native Americans presented by the world's most reliable news source, the BBC. Play the game Infinity of Nations: Culture Quest, presented by the Smithsonian Institute. You will gain extra knowledge about the tribes of North America and earn a badge every time you learn about a new tribe. Watch clips from the PBS documentary We Shall Remain. Several clips can be found at the bottom of the page. Just click and watch! PBS is one of the best and most reliable producer of television documentaries in the world. Check out their plethora of Native American Films and Clips to get a better understanding of Native American tribes. ﻿Gale Virtual Reference eBooks (GVRL)﻿ -- Includes more than 500 reference titles in full text. Within this site, you'll find three different databases for possible use: Gale Virtual Reference Library, Opposing Viewpoints in Context, and Student Resources in Context. Encyclopedia Brittanica Online -- One of the best and most reliable free online encyclopedias out there. The Smithsonian Institute -- One of America's most revered houses of research with credible links to past and present exhibits. Citation Machine -- To help you with all of your citation needs! SPAT Method -- A link to the form you need to evaluate websites used for research. For info on To Kill a Mockingbird Research Project, please visit the 8th Grade ELA Resource Website. There are so many online resources available for National Parks Research! I have listed a few below, so you don't get overwhelmed with all of the resources you might find in a Google search. Yes, Google CAN be your friend, but it can also give you so much resources that you don't know where to start. Check out one of the links below before diving into the (almost) limitless possibilities Google will give you. This is the official site for an amazing PBS documentary on the history of our national parks. It goes into detail about the formation of the National Parks system, Teddy Roosevelt's influence on them, and it has wonderful video clips and historical photos to go with it. I'm such a nerd I go to this site even when I don't have to! This specific section from the PBS documentary site I listed above has a profile and beautiful photos of each national park. Top notch stuff! This official government resource for the national parks has a wealth of information. You can search by park to find info on the park you've been assigned, web cams that are placed at some of the national parks, and of course, more gorgeous photos of our national parks. Get extra information for your project by pretending to plan your own trip to a national park. This section of the NPS website lets you search by state for your park, and then you can also learn about archaeology travel and heritage areas. There are several sites you can start your research with when compiling information on mental health topics. A few of them will be listed here, and then there are more specific links below for the disorders you will be researching for your project. Mentalhealth.gov -- This website is sponsored by the US Department of Health and Human Services. It also offers a special link just for teens to talk and learn about their mental health (OK2TALK). National Alliance on Mental Health (NAMI) -- With this organization's website, you can search for your mental health issue, and with most issues, you have the option of reading about how the issue can affect children and how it can affect adults. The search link is in the upper right hand corner. Here is a list of resources for each specific mental health topic you may have been assigned. Each link leads you to the information provided by Mentalhealth.gov. NOTE: These are not teen-specific facts, just general facts. Below are several links to videos about the evolution of comics/graphic novels and some of their finest superheroes. To be honest, this won't help much with your actual project, but they are sure fun and interesting to watch! Carol Tilley: Comic Book Crusader -- Watch the entire documentary about Carol Tilley and that comic bogeyman, Fredric Wertham. We watched a small clip in class, and it really is very good! (It's only 22 minutes, so give it a shot! Variant Comics YouTube Page -- Loads of great videos, including History Of's, Superhero Face Off's, and comic reviews. Here are several links to help you get a better grip on Pop Art and Propaganda Art. These two modern art forms are exciting, compelling, intriguing, and extremely fun to look at and study. There really is a story behind every artist and every piece of art. Want to mix art AND information? Create an infographic! Infographics are fun to look at, study, and create. And, you can create an infographic for practically anything! (SEE LEFT: An infographic about Justin Timberlake's hair.) While in 6th grade Art, we will look at the history of infographics, and then you'll get to pick your own topic to create an infographic for. I can't wait to see yours! ​While you wait to create, check out some of these awesome sites below. NOTE: If you want to use Canva or Piktochart to create your own digital infographic, you MUST have a parent's permission.